From Sedgefield, take the N2 to Knysna, turn left at the Ruigtevlei/Karatara turn off, continue for 3kms and turn left again to Karatara. Go over the little bridge, past Karawater. 500m down the road on the right there is a large dirt road, with a long pole full of wooden signs and “no entry”, turn right here. 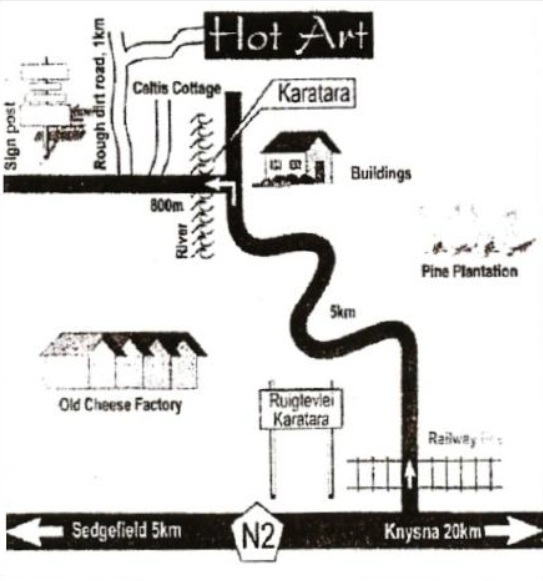 Continue up the road for 1.5kms, turn right into “Hot Art” carry on down all the way, park under the tree and the studio is on the right hand side. Please be advised the road is very bad, take the road slowly. Visitors are welcome to the studio. Please make an appointment.